I did a review for Neostrata products last year and really enjoyed them! A few weeks ago, the company emailed me asking if I wanted to try their Exuviance Heel Repair Cream since it had recently won an award. I said sure because I have such rough heels. After receiving this product, I started to apply it to my feet daily. 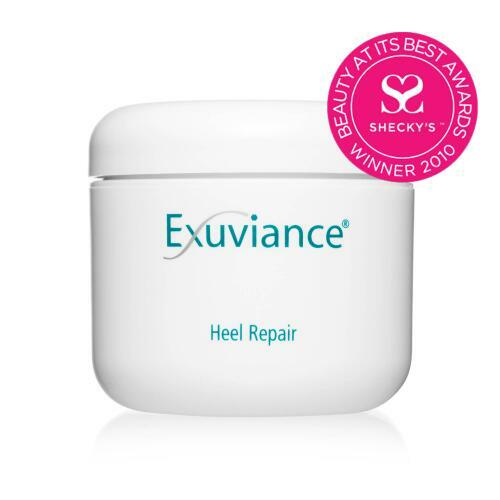 This cream exfoliates, sooths, and smooths dry and cracked heels. This product has really made my heels much softer which is great as Summer is approaching. This product retails for $38 and can be purchased on the Neostrata site. The giveaway will be for the Neostrata Exuviance Heel Repair Creams to 3 lucky winners (a $38 value!). The giveaway is open until Midnight on Tuesday April 12th. Winner will be chosen on Wednesday April 13th using Random.org. The winner will have 48 hours to respond or a new winner will be chosen. Visit the Neostata site and let me know another product that you would like to try. NeoStrata Lotion Plus is another product I would love to try. This would be good for my skin. I like the neostrata bionic lotion. I would like to try the NeoStrata Facial Cleanser Duo. I really need the Heel Repair, but I'd also like to try the Exuviance Age Reverse Night Lift.....sounds great. I REALLY need some heel help! I'd also like the Exuviance Skin Caring Foundation SPF 15. I like the FB site. I added a link to your site at the bottom of my blog. You are #107. I'd like to try the Bio-Hydrating Cream. My heels are horrible. Nothing I have tried works very well, would love to try this! Another product I'd like to try is the NeoStrata Ultra Moisturizing Face Cream. Thanks for the review and giveaway! I would love to try the Exuviance Evening Restorative Complex. I'd like totry the bio-hydrating cream, but my heels need the most help -- lol -- thanks for the chance! I already like the Nutritionist Reviews on FB. I like the Nutritionist Reviews on FB -- entry #2. I subscribe via email -- entry #2. I would love to try the NeoStrata Face Cream Plus. I would like to try the Neostrata Ultra Moisturizing face cream! i also entered in the Auric perfume giveaway! I would like to try the Exuviance Purifying Clay Masque. I'd like to try the Exuviance Evening Restorative Complex for my aging skin. I want to try the coverblend skin caring foundation. the neostrata bionic lotion sounds great. I want to try the face cream too! I would love to try the Exuviance Night Lift. Hey, even guys get puffy eyes, so I'd use the Bionic Eye Cream. I would love to try the Exuviance Moisturizing Antibacterial Facial Cleanser Duo. Sounds great! I'd love to try the NeoStrata Bio-Hydrating Cream. I would like to try the NeoStrata Skin Brightening Gel. I would also love to try the Exuviance Age REverse Night Lift! Thanks! I would also like to try the NeoStrata Skin Active Exfoliating Wash. I would like to try the Exuviance Antiaging Solutions Kit. I would like to try NeoStrata Skin Active Cellular Restoration. I'd like to try the NeoStrata Oily Skin Solution. NeoStrata Skin Active Exfoliating Wash.
NeoStrata Cellular Repair is another product I would like to try. I like the NeoStrata Renewal Cream sounds nice! Great giveaway thank you.